OK, here’s the disclaimer: I was not asked to review or rate any of the following products. I am not being compensated in any way for promoting them, aside from the joy I get from passing along a great find to others who might be blessed by it. 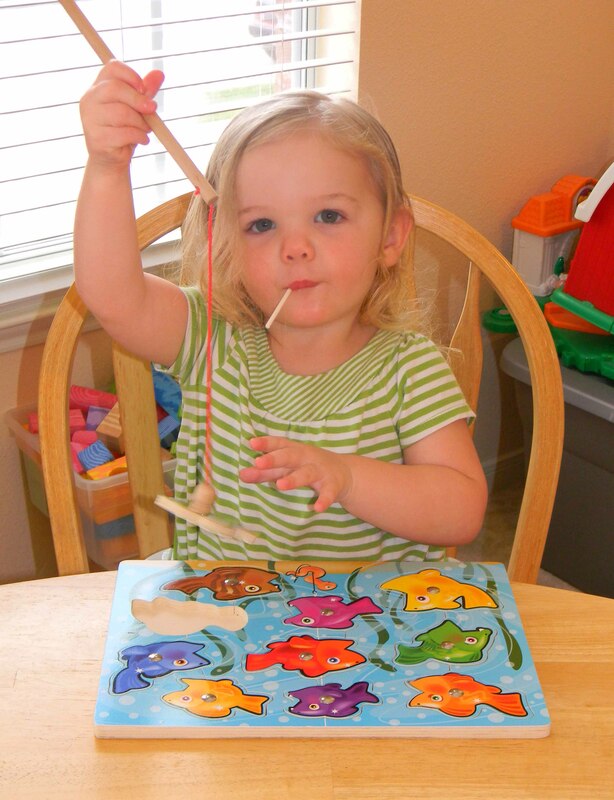 So…now that we have that out of the way, here are some of my (and my toddler’s) very favorite learn-by-playing resources. 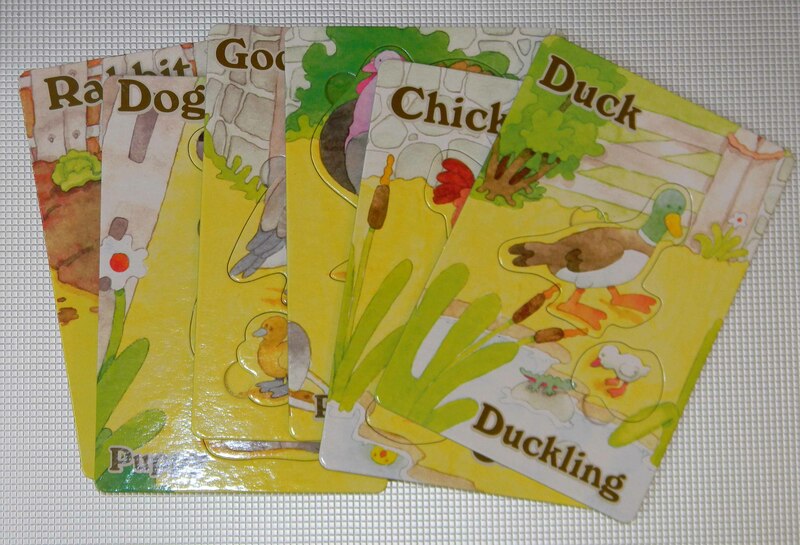 …as well as an assortment of sturdy board books that are his to play with and “read” on his own. 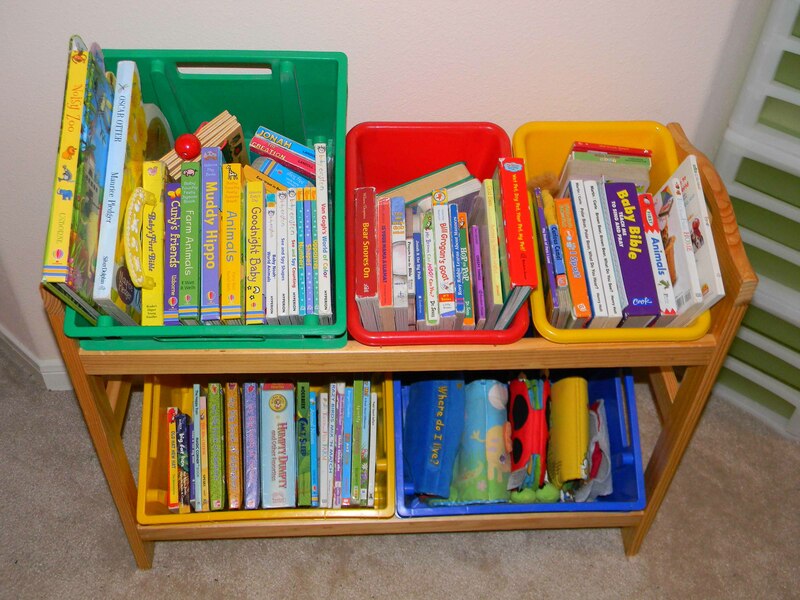 He should have easy access to this second set of books so that he can handle them any time he chooses. On a side note: I am a HUGE fan of the public library…but NOT for board books. I have seen way too many booger-picking, book-chewing toddlers to want to see those books go into my little one’s hands and mouth! 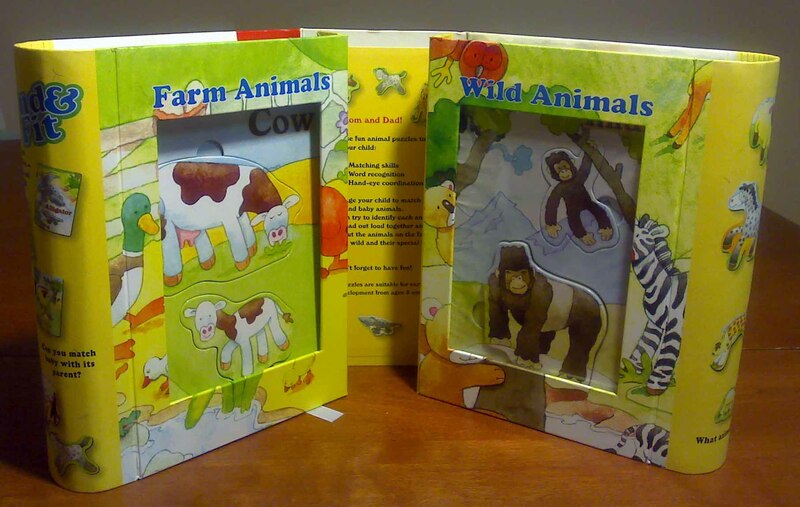 Invest in a set of fun, colorful board books–you don’t have to buy them all at once. Ask for them (and give them) for Christmas and birthday gifts, and watch for sales and good deals while you’re out and about. (I’ve found some really good deals at surprising places like Marshall’s.) And by all means, use the public library as much as possible to check out the books YOU will be reading TO your tot. Need a starting point for what to read? I recommend Dr. Seuss. That guy was brilliant! The Rhyme Bible This is what we’re currently reading to our toddler during our family devotionals in the evenings. I have always loved this one because of the fun rhyming text. Our kids have loved it, too—it was the first “Bible” our older children each read on their own, and they couldn’t put it down! The art is cartoonish but fun, and the lyrical verse makes us want to keep turning pages. It makes Bible time FUN. 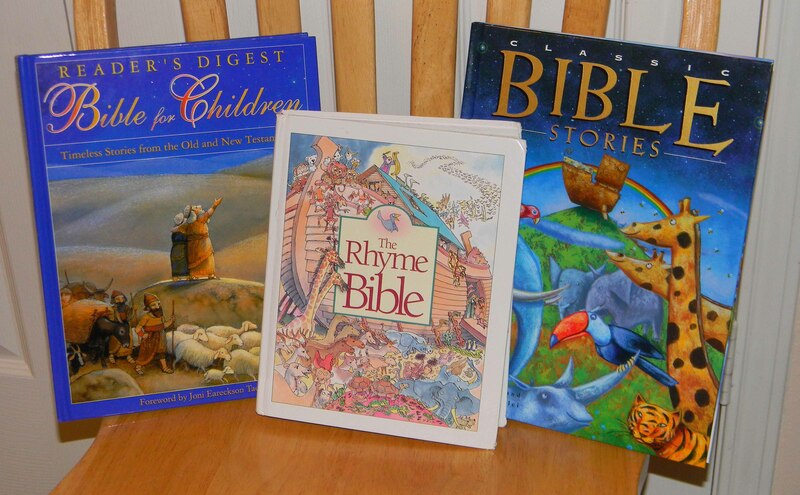 Love the Rhyme Bible! Classic Bible Stories I love this one because the art is absolutely gorgeous, and the passages are just the right length for little ones—one opening for each story, with the beautiful illustrations (by Italian artist Tommaso d’Incalci) taking up much of each double-page spread. There are 28 stories in all. The Reader’s Digest Bible for Children I picked this one up at a used book sale somewhere and I love it because it’s big, full of all kinds of Bible stories (waaay beyond Jonah, Noah, and Baby Jesus! ), and is probably the most accurate re-telling I’ve found. I should say here that I don’t think I’ve ever seen a children’s Bible story book that didn’t contain some biblical inaccuracies, which means that you—the parent—will just have to be on top of your game while reading. At this stage it’s not too big of a deal, because you’re the one doing the reading and your tiny tot won’t even know if you’re changing the words. But you’ll have to do a lot more of that with some books than others, so it’s nice to have one that you can just read and enjoy! 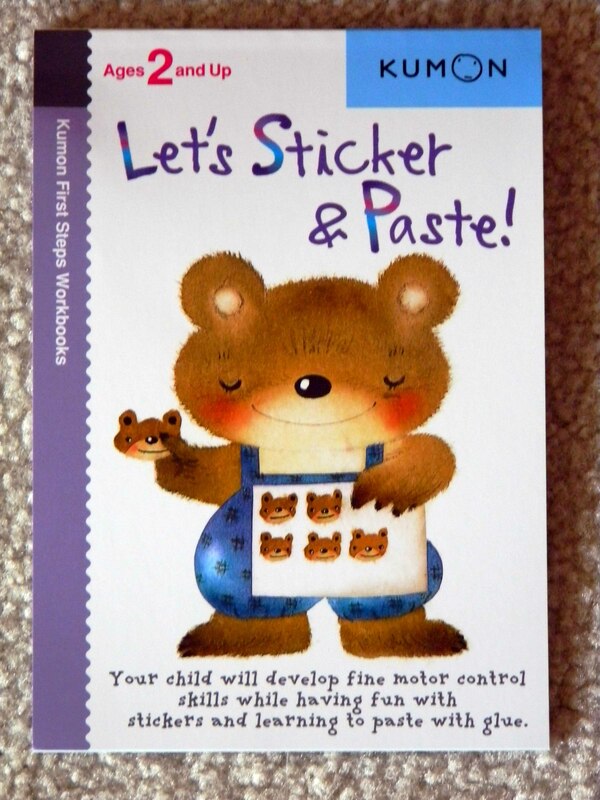 I should also mention that this book is not written on a toddler level, so it may not be the one you start out with…but reading to your children above their level is also a good thing. (I’ll save that for another post…) If you have older and younger kiddos doing Bible time together, this might be a good choice. 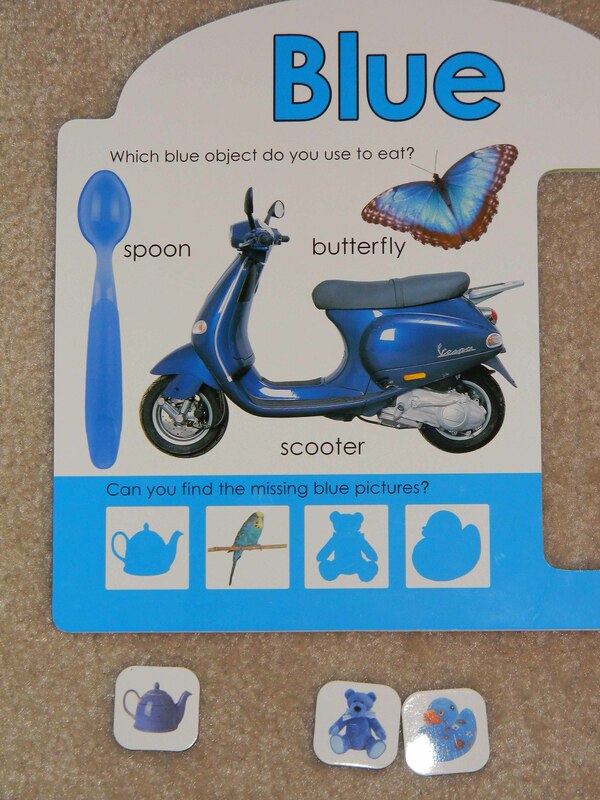 Here’s an activity that’s right up near the top of my daughter’s list of favorites, and the fact that it’s super CHEAP and EASY to set up makes it a favorite for me, too. Because this is something a toddler can do independently, it’s great when you need to “buy some time” for something else…especially if you save it for special occasions. 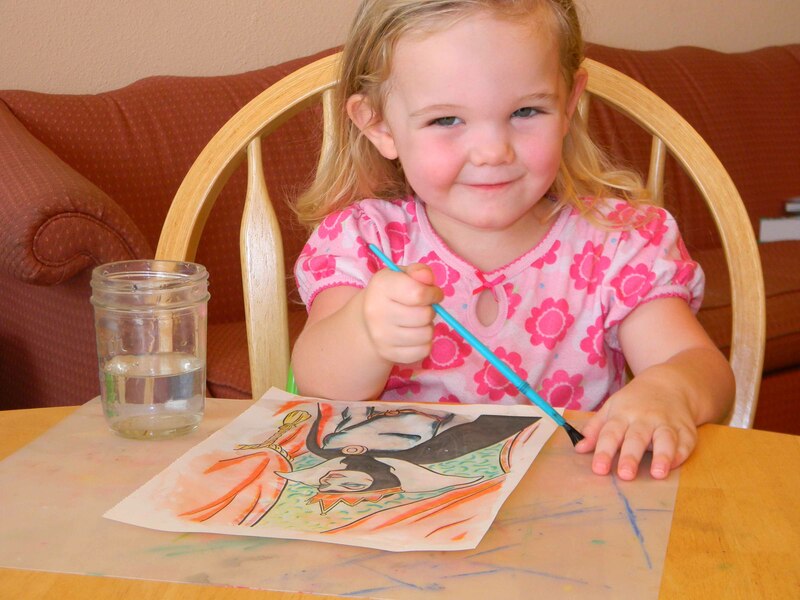 My daughter loves to paint with water, but she knows she is only allowed to do it while I’m doing our morning Bible study with the older kids. This keeps it special for her and buys some sweet silence (and stillness) for the rest of us while we study. The fact that there’s virtually no mess is icing on the cake. You can find these at any discount store or bookstore. 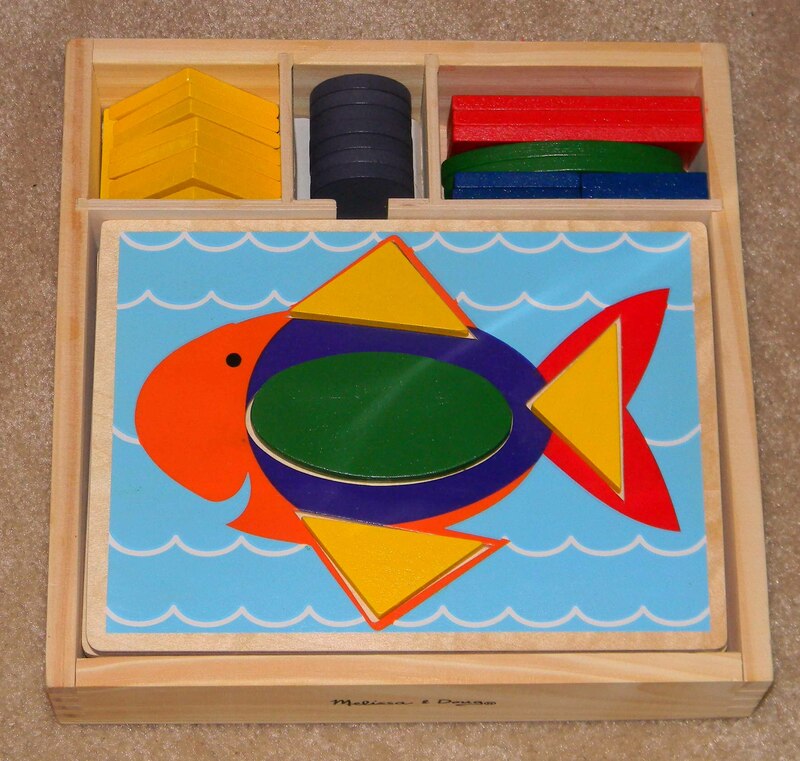 I’m a big fan of wooden puzzles. 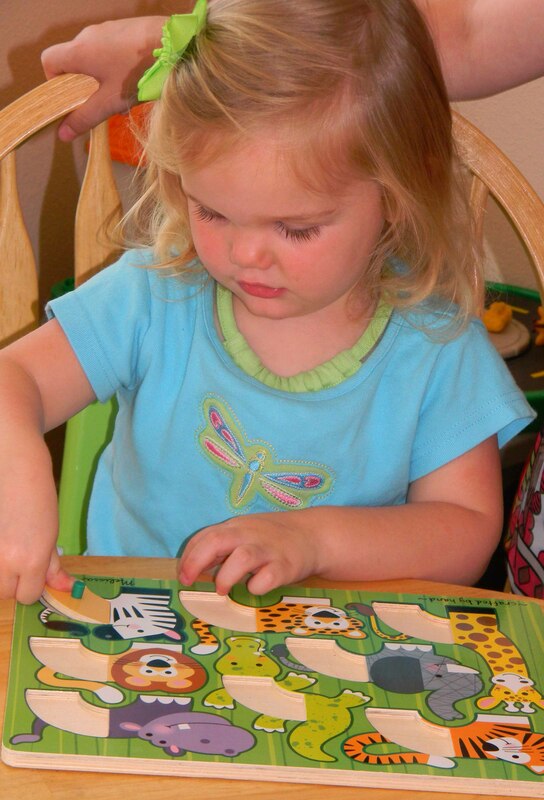 Actually, I’m a fan of lots of puzzles…We use foam, floor, jigsaw, and more…But the wooden puzzles are my favorites. They hold up so well and are easy for chubby little hands to manipulate. 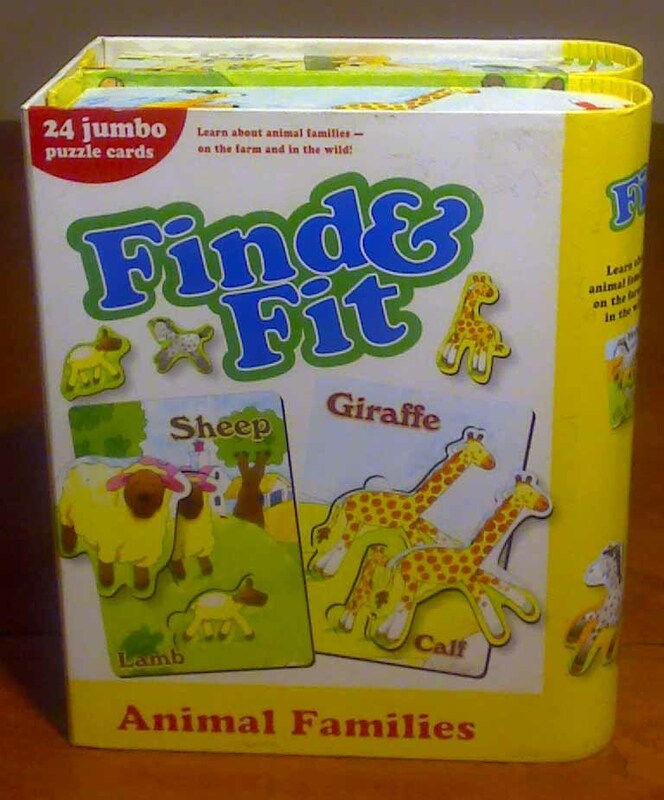 You can get them at most toy stores, discount stores, and bookstores. I found this at Half Price Books and fell in love. 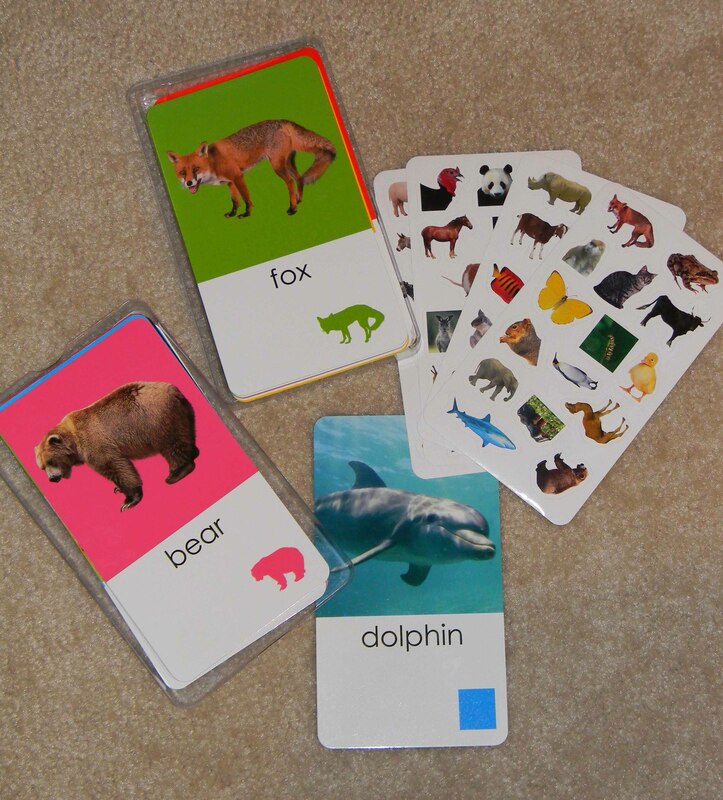 …and she can fit the animal shapes in like puzzle pieces, figuring out which pieces go with which cards. 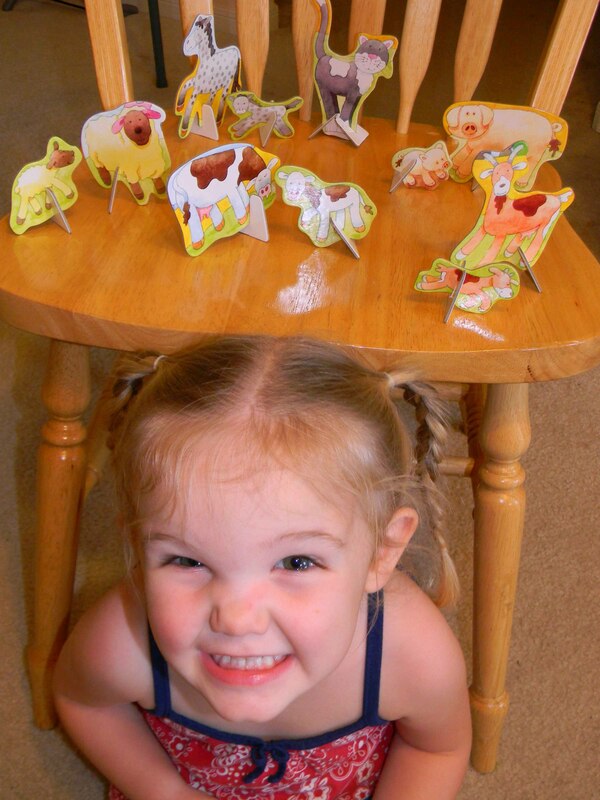 …and put them on their little stands for imaginative play. As you can see, we have LOTS of fun with this set! The guy who did these fun CDs is a genius! 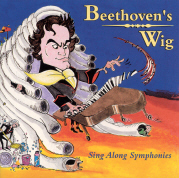 He added hilarious lyrics to well-known classical pieces by the great composers. My toddler can’t get enough! After the last song ends, they all play again without the funny lyrics, and I must admit that I didn’t learn nearly as much in my college music appreciation class as I did from these CDs, as far as being able to recognize the pieces and composers. Plus, it’s pretty cool to be driving down the street and hear your two-year-old belting out phrases like “When you’re an opera star, with a large repertoire…” She knows about composers like Verdi, Schubert, and Paganini, and I would never have figured out on my own how to teach her about them at this young age. Love, love these CDs. Although I’m only showing a few, there are LOTS of cards in this set—so many that we started out using just a few at a time and have been adding more and more as she gets better at playing the games. What do we do with these? 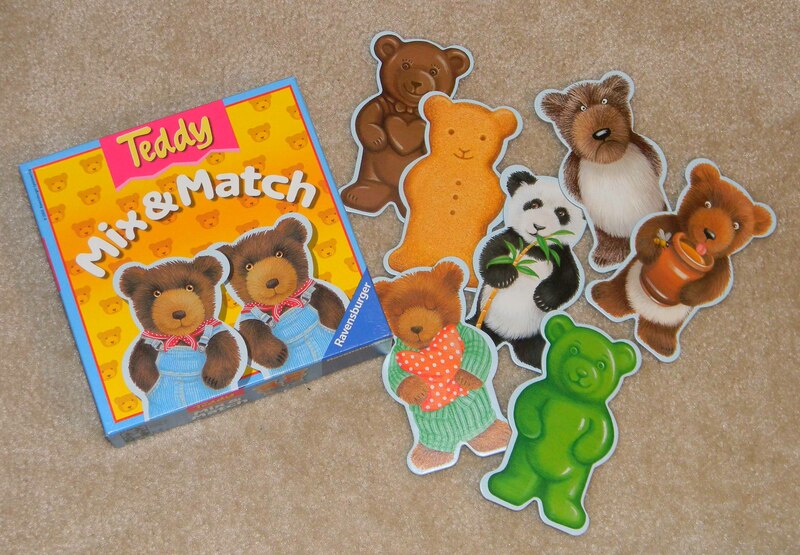 First, we try to make matches of all the different pairs of bears. Remi makes up names for them, like Sleepy Bear, Pocket Bear, etc. Then we turn them over and play a memory game with them. Sometimes she likes just pretending with them, making them talk to each other, and making up stories about them. 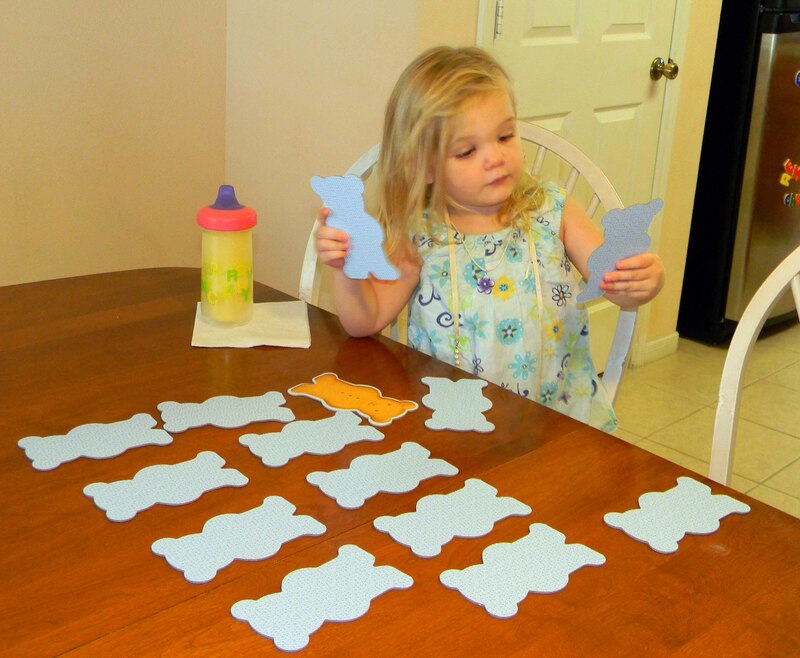 They came two to a punch-out card, and I saved some of the card backs so we can also use them as stencils to make and decorate our own bears when she’s a little older. 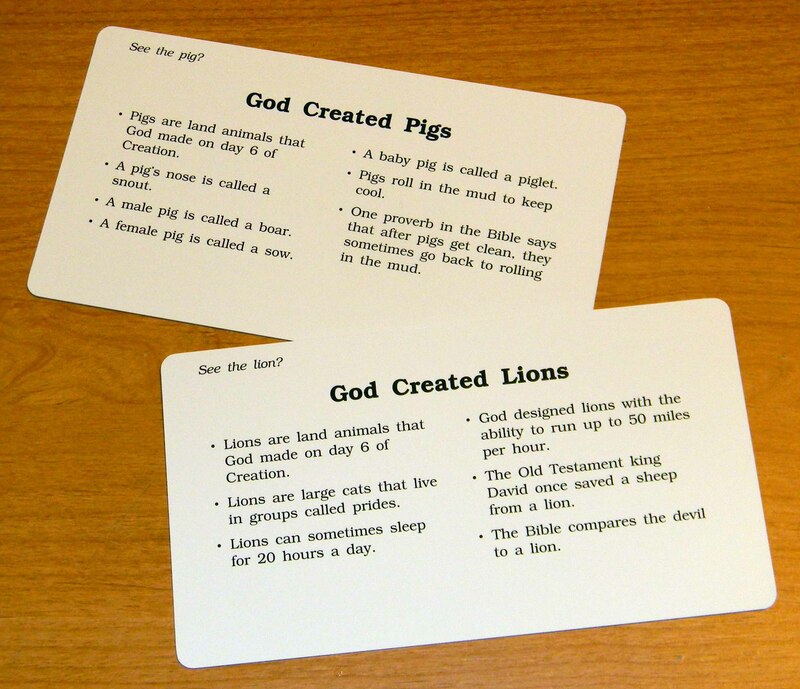 I ordered these from Sonlight Curriculum. (Apologies for the awful phone pic above…It was a last-minute addition so you could see the what the box looks like…kind of…) I love that these cards are so BIG. I love that the clear, colorful photographs are so eye catching. 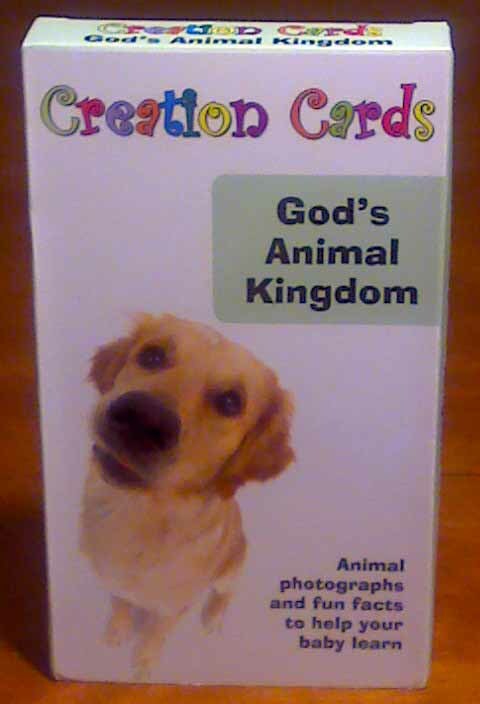 And I love that on the back of each, there are simple science facts to share with your child and examples of how the animal is mentioned in the Bible. I should say again that it may be the only reason Remi is so interested in this type of activity is that she has older siblings being homeschooled right in front of her each day. 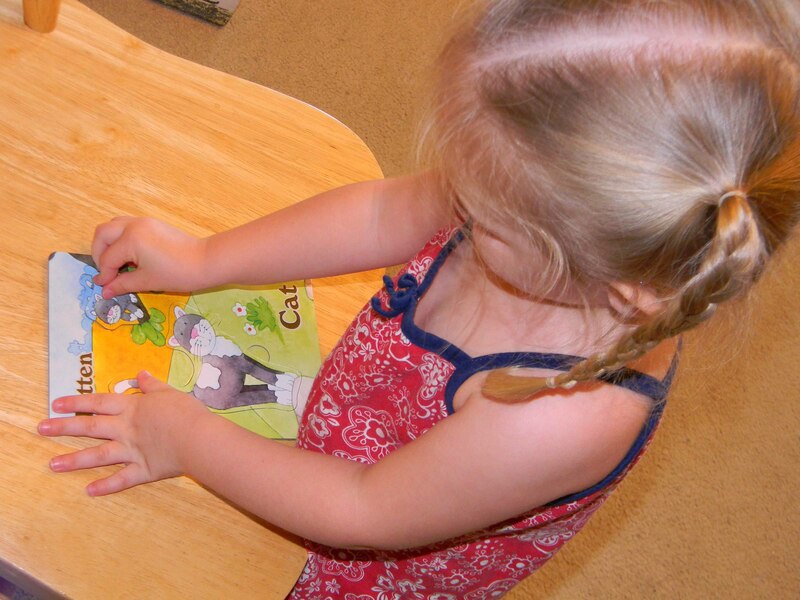 Don’t feel pressure from anyone to use workbooks of any kind with your toddler–they just aren’t necessary. If, however, your little one is wanting to do what the big kids do, I highly recommend these over any others I’ve seen. 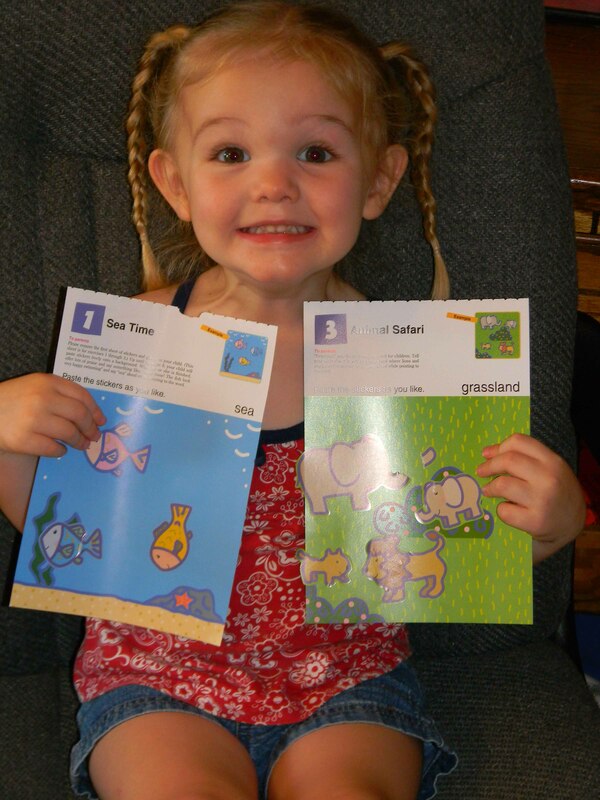 There are lots of Kumon workbooks, so make sure you start with the First Steps series. I ordered mine from Amazon. These CDs are such a great (and easy!) 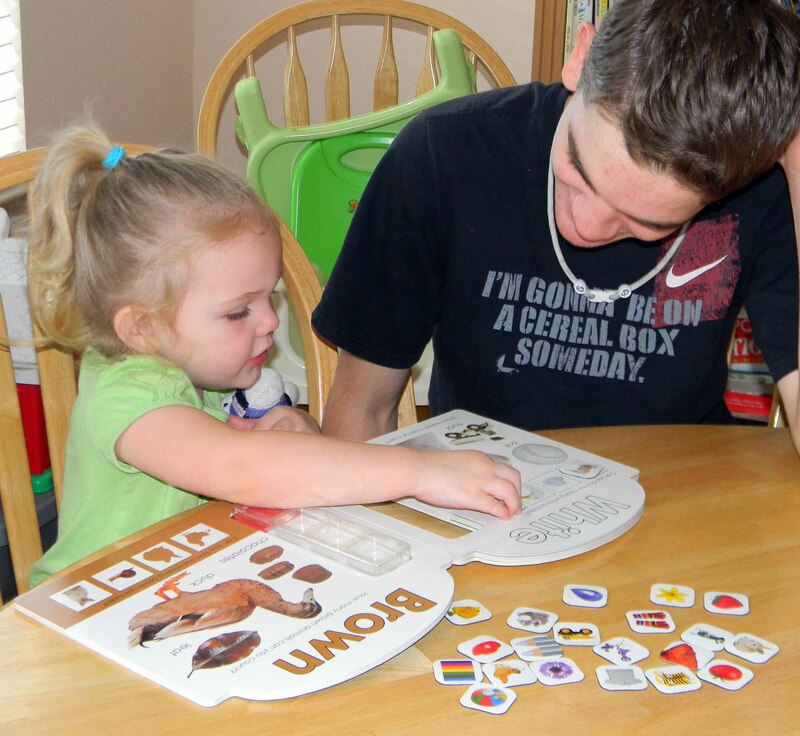 way to put God’s Word into your little tot’s heart and mind. 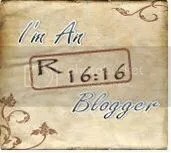 The text of each is taken word for word, directly from the Bible (in your choice of KJV or NIV), but the man who reads it does so quite dramatically. There are even background noises sprinkled throughout, and the way these are done really makes the Bible come alive for little listeners. I have always let my toddlers (and preschoolers and beyond) listen to these in bed at night, after the lights are out. 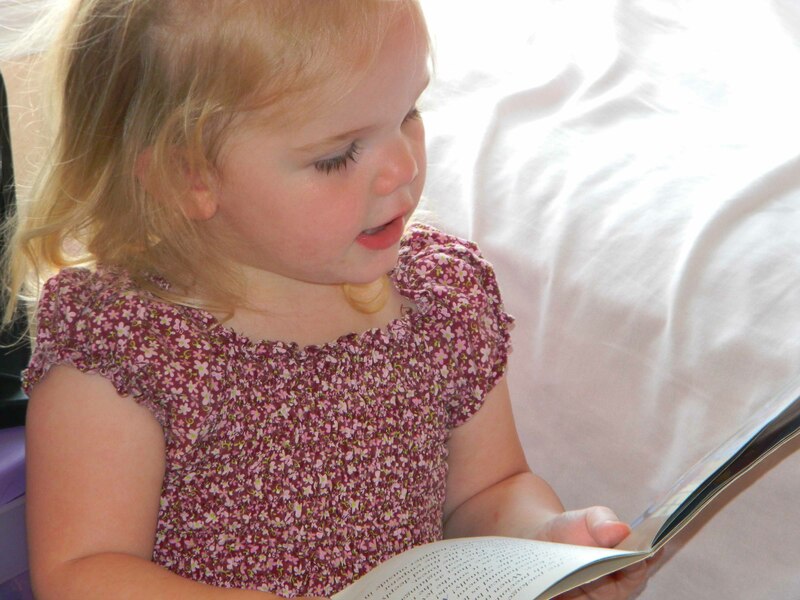 Because the “stories” are taken directly from the Bible, your little one will actually be memorizing Scripture without even knowing it. And I’m not talking about “baby” memory verses, either. I remember when my son, Connor, had just turned four, and he walked in the kitchen for breakfast one morning calling out, “And the edict was issued in the citadel of Susa.” WHAT?! Turns out he was quoting from Esther 8:14. Get these CDs! I think I love everything they’ve ever made. They’re sturdy, usually wooden (or of other natural materials), and colorful. They’re all simple and educational, and you won’t need a single battery! They are of such high quality that my usual, penny-pinching self quietly exits the room when I see these items. I think they’re worth the splurge. They have too many good things to mention here, so check their website for ideas for Christmas gifts, etc. You’ll come back and thank me! I have purchased these everywhere from homeschool conventions to yard sales. (A word of warning here: If I spot one of their products at a yard sale, you’ll probably want to get out of my way, and fast! I may just knock you down in my rush to grab it. Otherwise, I’m very sweet. Really.) 🙂 Good stuff. See that little pink face at the top? That tells you you’ve found a Priddy product. There is just something about their clean style that I love for young children. 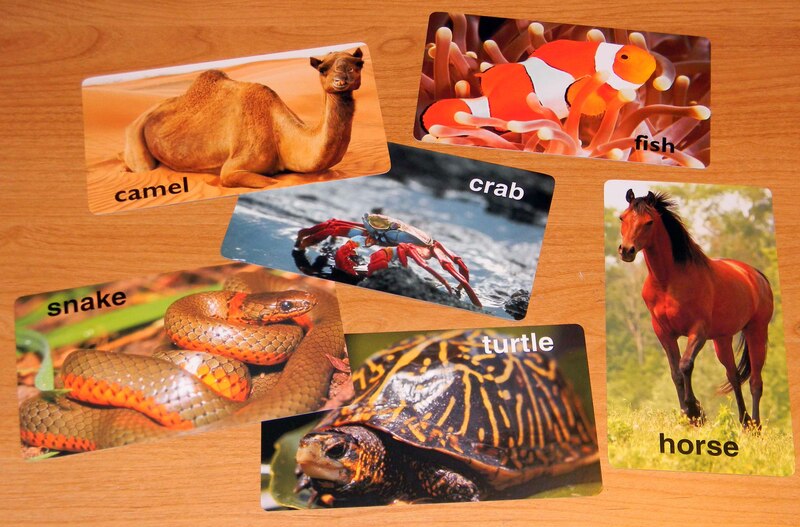 Here’s an example of their flashcards, complete with stickers. I love the clean design. 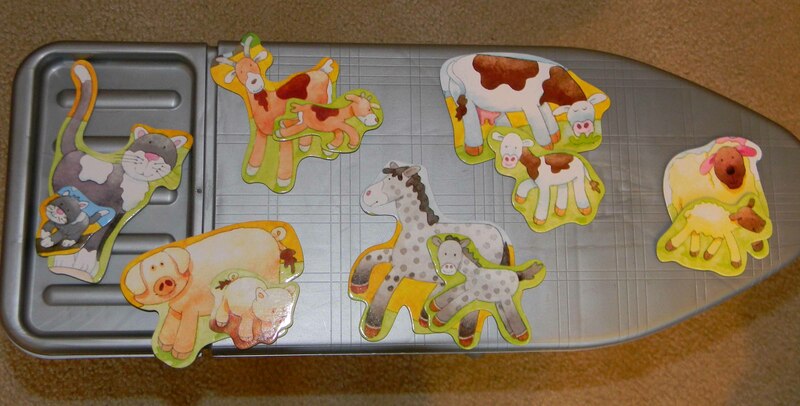 For older toddlers, I recommend their sticker books, too. I get my Priddy products from Amazon and Half-Price Books. I’m pretty sure she would do this all day long if she could. 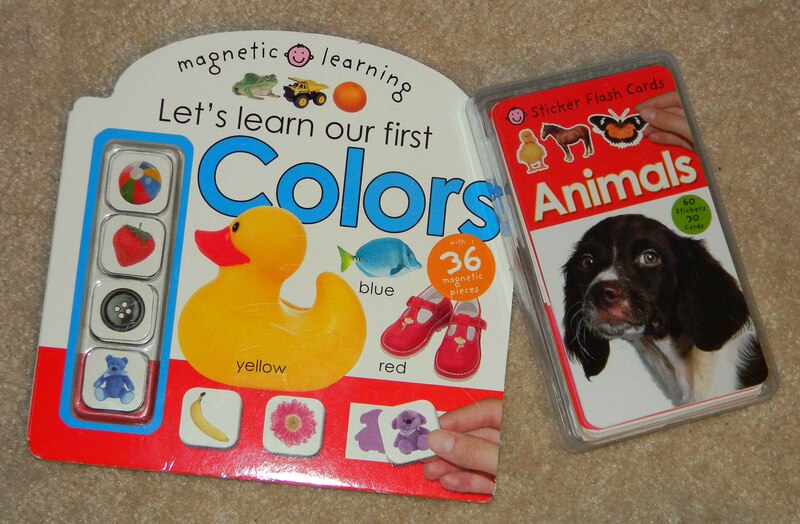 There you have it, my very favorite resources for fun ways to teach little ones at home. Would you take just a moment to share one of your favorites in the comments? 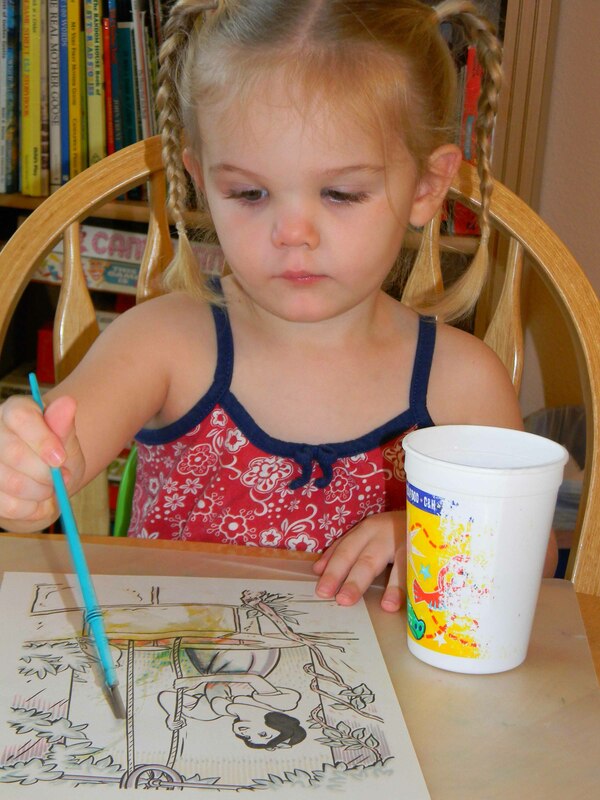 I have enjoyed reading your toddler series this week. 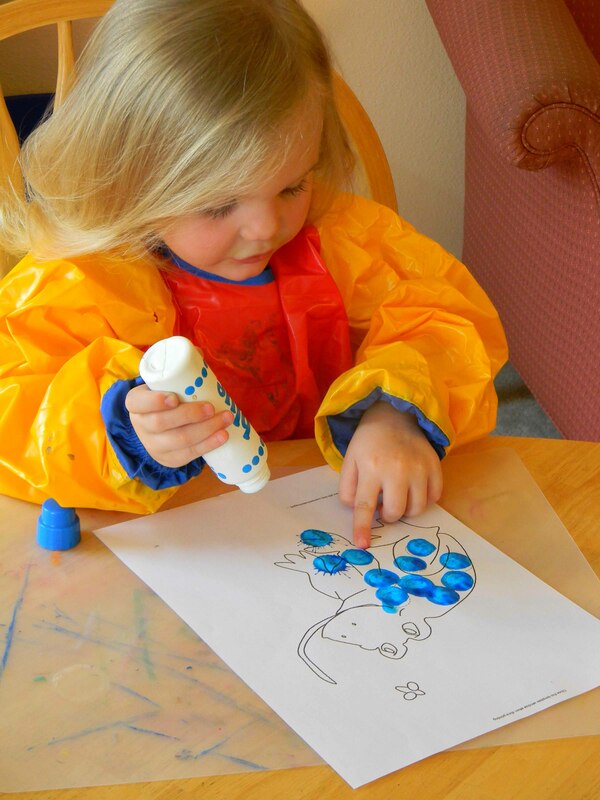 Thanks for all the suggestions for toddler resources I am adding some of these to our Christmas list. I loved all of your posts. I have really been needing some encouragement on being more organized in this area. Wonderful tips and ideas. Thanks, SuperMama!!! And I mean that…you are a super mama!! 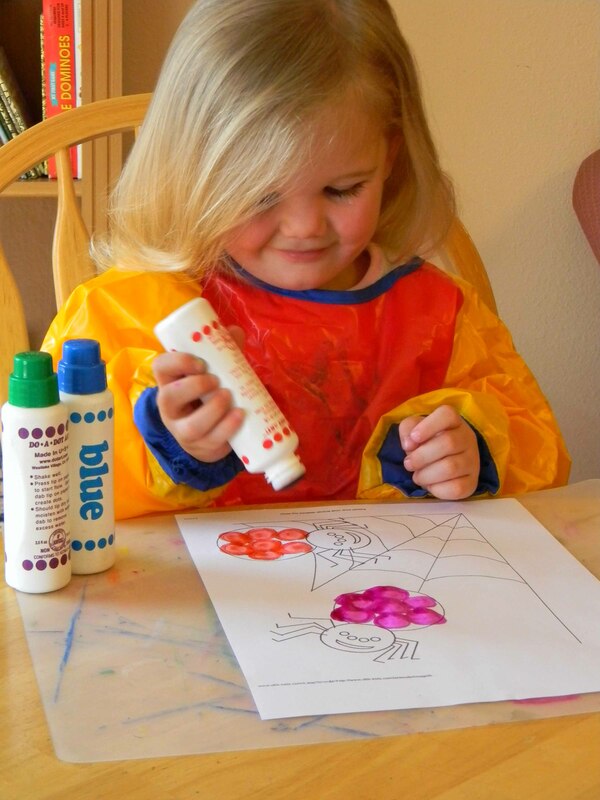 i just found your site…and caught up on all your tiny tots posts! i loved it! thanks for sharing everything, i started my amazon wish list! Thank you, LaVonne! I keep a running list on there, too! I’m glad you enjoyed the posts, and I wish you the best in your tot school and hope you’ll continue to join us here!